Hundreds of wild horses from a Louisiana military base are being relocated to North Texas in what is being called a life-saving effort. The Humane Society of North Texas is playing host to some extraordinary equine at their Decatur location in Wise County. "It's an honor to work with the Army and be a part of this," Humane Society of North Texas Executive Director, Sandy Shelby said. "It is kind of historic." The first 50 of a herd of nearly 400 horses are in North Texas. 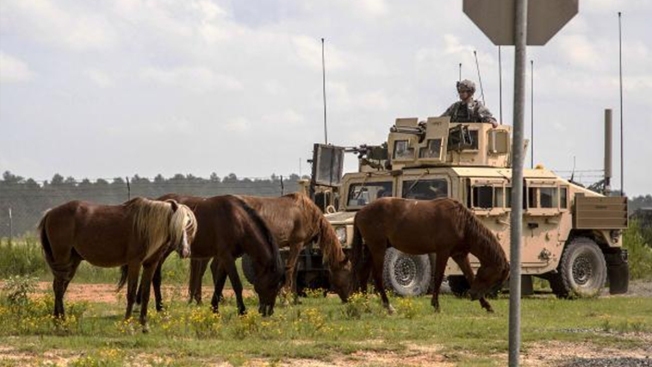 The horses were taken from Fort Polk Joint Readiness Training Center, which is an Army base in Louisiana. "They've been there for many, many, many years. And the army realized with weaponry and vehicles and all the things that go on on an Army base, it's not a safe place for either the military people or the horses,” Shelby said. “So they decided they needed to be relocated." "Sadly what was happening was a lot of the people who were ‘kill buyers’ were raising their hands wanting to come in and get these horses,” Shelby said. “To make money off of them to ship to Mexico for meat… which is really, really sad." The Humane Society of North Texas stepped in. They contact the US Army and worked out a plan to get the horses moved safely off the base. They will move the horses at around 50 at a time for the next two years. The horses have had little human interaction and volunteers said they need a special home. “Whoever comes in that wants to get involved in this does need to be an experienced horse person,” Shelby said. “We'll keep [the horses] as long as we need to until every last one of them gets a home." The Humane Society estimates the rescue effort will cost over $50,000 and is asking those who cannot adopt make a donation to help feed and house the horses while they await adoption.